* In 1961, when Julia Chase edged to the start of a Connecticut 5-miler, officials tried to push her off the road. * The next year at Boston, Kathrine Switzer was assaulted mid-marathon by a furious race organizer. * In the mid-60s, Indianapolis high schooler Cheryl Bridges was told not to run anywhere near the boys’ track team because she might “distract” them. * When Charlotte Lettis signed up for the University of Massachusetts cross-country team in the fall of 1971, she was told to use the men’s locker room. * A few years later in coastal Maine, young Joan Benoit would stop her workouts to pretend she was picking roadside flowers. Benoit was embarrassed that her neighbors might spot her running. 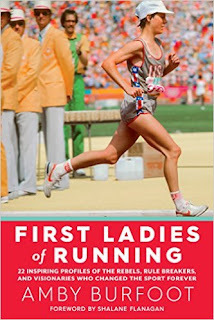 First Ladies of Running tells the inspiring stories of pioneer runners from 1958 until the moment when Joan Benoit hits the finish line to win the 1984 first Olympic Marathon for women. These fiercely independent women refused to give up despite the cultural and sports barriers they faced. Legends such as Doris Brown, Francie Larrieu, Mary Decker, Jackie Hansen, Miki Gorman, and Grete Waitz are chronicled by Runner’s World editor Amby Burfoot, who has followed the women’s running movement for 50 years. In a special additional chapter, Burfoot runs the Marine Corps Marathon with Oprah Winfrey 10 years after Benoit's Olympic triumph. Winfrey's successful finish opened the floodgates for millions of midpack women runners. By refusing to quit in the face of adversity, the pioneer runners inspired the next generations of women both on and off the track. First Ladies of Running is a beautiful and long-overdue tribute to the trailblazers of women’s running, and a gift of empowerment for female runners everywhere. It will make an especially great gift for the many teen runners who participate in cross-country each fall. With a Foreword by Olympic 10,000-meter bronze medalist (2008) and top American marathoner Shalane Flanagan.